Pat Fisher’s country out of Great Falls, Montana is some of the most spectacular scenery I’ve ever seen, straight out of Legends of the Fall. The whitetails own the valleys, lots of deer with high buck-to-doe ratios and some really nice bucks; the mule deer are found higher up on the ridges, also plentiful with very good quality. I had a really wonderful whitetail hunt there in 2015 and can’t wait to go back! Enjoy Great Hunting with Fisher Outfitters and Hawaii Safaris!!! Thank you for your interest in hunting with us at Fisher Outfitters, Inc. We have been a full service outfitting and guiding company since 1992. Our outfitting and guiding origins began after Patrick Fisher returned home to Hawaii with a degree in wildlife biology from Colorado State University in 1991. Twenty-five years of providing quality hunts and multiple requests by our valued customers for unique, trophy hunting opportunities has driven our outfitting and guiding operations to what they are today. 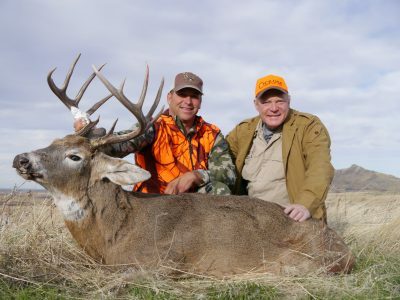 Through many years of experience and a discriminating eye, we also offer guide trophy hunting for mule deer, whitetail deer, and rocky mountain elk in central Montana (Outfitter #4181). Hunting is our passion and providing a quality hunting experience for each individual hunter is our mission. Fisher Outfitters Montana hunting properties encompass 22,000 acres of excellent populations of mule deer, whitetail deer and Rocky Mountain elk. Year round big game hunting in Hawaii as well as seven game bird species is available on our large Hawaii ranches. Don’t forget to check out our Hawaii Offshore Fishing! We hope to share our excellent, diverse hunting opportunities with you in the near future and until then good and safe hunting!